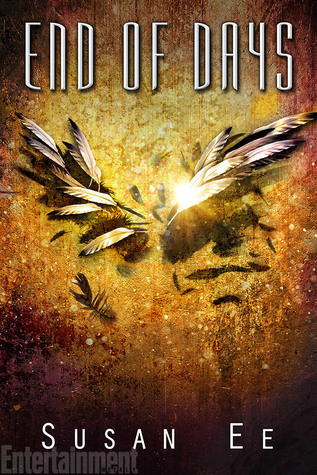 Let me just say right off the bat that the Penryn and The End of Days trilogy is one of my most favorite reads this year. It's unlike anything I've ever read, as well as completely riveting, emotionally involving, and written with a great set of characters. Highly recommend this series! Angelfall and World After (the first two books in this trilogy), were emotionally involving because of the themes on immediate family and the human race as a family. I have often felt proud to be an American, proud to be a member of my family, etc. But I have never felt proud to be human the way I did while reading this. To put it simply End of Days gives us: Humans vs Angels. Angels vs. Angels. Penryn vs Raffe. Raffe vs Uriel. Lots of showdowns going on and I don’t want to really get into it more than that because I don’t want to give anything away. ha. While the romance in this book was pretty back seat in the first two books, it comes to the forefront in End of Days. I still like that Susan Ee kept the romance secondary to everything else, and really let many of the other characters, themes, and tension-filled storyline take the lead. Twice this book had me in tears. It’s funny the parts of books that draw visible emotion from readers, and I was surprised by which characters had me crying. I found this series end to be well wrapped up, super tense, and overall satisfying. I had some minor questions that remained unanswered regarding Penryn’s mother though. (There was a great set of characters, and Penryn is definitely rising to the top of my favorite female characters. I found this to be completely different from anything I’ve read and highly recommend it.